Bedale is a thriving members club which has been in operation for over 110 years. The course is located in a beautiful parkland setting with many natural features and hazards. 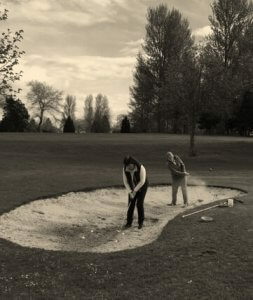 Although a challenging course it is suitable for all levels of golfer. We offer a full golfing calendar which includes our own club competitions including the Claret Jug, Club Championship, a range of Ladies and Juniors competitions as well as a very successful Winter League which boasts over 100 mixed players every 2/3 weeks competing for a highly valued trophy. Our off-course facilities are also excellent. The comfortable and friendly clubhouse has good secure changing room accommodation. You also have the opportunity to view the 1st and 18th holes from the clubhouse bar before choosing snacks or a full menu in the dining room. The brand new Swing Studio has proven to be a great success even before the really bad weather and lessons are available from our professionals. Members can make bookings using our BRS booking system. Bedale Golf Club has been the ‘Golfing Gateway to the Dales’ for over a century, its natural deer park setting offering some of the most pleasurable golfing terrain in the North of England. The Club was formed following a meeting held on the 20th November 1894 with nine gentlemen present on land owned by Sir Henry Beresford Pierse. This nine hole course was over the area at present occupied by the first six holes plus some land to the right of the second fairway. To mark the opening an exhibition match was played on the 6th December between the professionals from Studley Royal and Richmond Golf Clubs. The details of this match are held in club records. The course remained on this site until 1921, when land was rented over an area approximately covered by the present 11th to 15th holes and although this was only six holes, it remained here until 1932 when the course moved to a new site off the Firby Road. The layout and development of the course was under the direction of the Professional/Green Keeper John Raper and it remained on this site until 1967. The high point of the time at Firby Road was an exhibition match played in 1947 to raise money for the Soldiers, Sailors and Air Force Association and included Norman Von Nida, the Australian Golfer, Dai Rees, the Ryder Cup player together with Syd Scott and Bill Shankland. When the club moved back in 1967 the 18-hole course was relatively short, and it was decided in 1987 to purchase 30 acres of land and appoint Hawtrees the Golf Architects to incorporate the new land into the existing course, which is the course, you play today. The 30 acres concerned have enabled the course to be lengthened to a demanding 6,580 yards. The overwhelming feature of the Course is the abundance of mature trees, which play an important role in giving definition to the lush inviting fairways. The 13th is the signature hole of the course, played from an elevated tee with a carry over an area of marshland designated as a lateral water hazard, with out of bounds to the right. The contoured fairway to the left offers generous sanctuary, however it is difficult to ignore the temptation of the seemingly achievable carry over the hazard to give a shorter approach to the two tiered putting surface. To single out any hole from the more mature segment of the course is as taxing as the layout itself. Particular favourites are the 2nd, a tough par five, and the 3rd, a demanding two shotter. The former demands a precise drive from the tee to hold the fairway, the hole sweeps subtly to the right with out of bounds lurking at its flank, bunkers also play their part in trapping the unwary although it is the babbling brook which protects the front of the green which catches the lion’s share of the casualties. Having overcome the demands of the previous hole, the 3rd is a par four out of the top drawer. Two magnificent trees adorn each side of the fairway demanding bulls-eye accuracy from the tee, to set up position for the approach to the sloping green which nestles in the shadows of the old estate boundary wall. The course is par 72, with a standard scratch rating of 72, and really does offer an enjoyable test for both the novice and experienced golfer. Its reputation continues to grow and has now become a regular venue for prestigious regional competitions. This is a tribute to the greens staff who skilfully maintain the course at an exceptional level of presentation year round.